The 40th annual Destin Seafood Festival takes place along the Destin harbor boardwalk Oct. 5-7, 2018! Come out to the world’s luckiest fishing village for a great weekend of seafood, live music and family fun. More than 70,000 locals and visitors are expected to attend, and this three day festival will be filled with great seafood and live entertainment on the Destin Harbor. Free admission. Destin, Florida, just west of South Walton Beaches, has long been known as “the world’s luckiest fishing village”, but more recently it has been the epicenter of the Emerald Coast’s development boom. Within a couple of decades, the town transformed from a sleepy fishing village to a modern and bustling tourist town. Its working harbor, once modestly lined with fishing wharfs is now lined with high-rise condos, restaurants and luxury yachts. 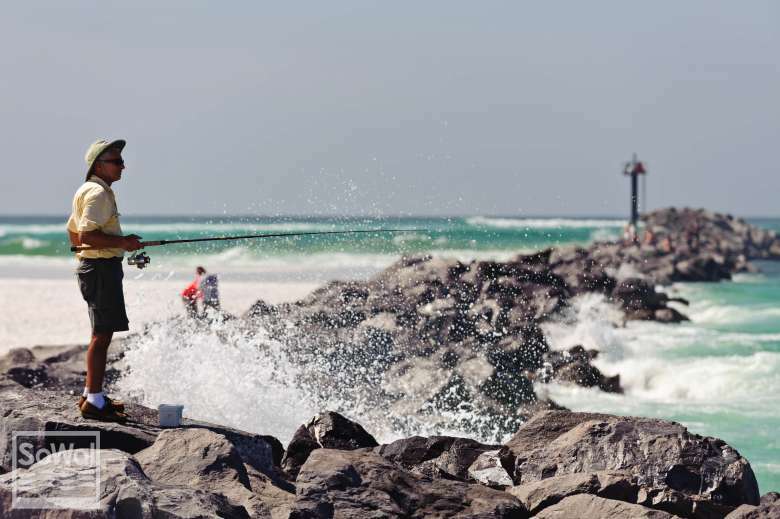 But even through rapid growth, Destin has still maintained its unique charm and reputation as a world-class fishing destination. Its roots as a fishing village go back more than 150 years. The town’s namesake, Leonard Destin, was a fisherman from Connecticut who stumbled upon the area on a long trip out to sea. He found the harbor hospitable and the fish plentiful and ended up settling there with his family. His descendants still live in Destin today. Because the city is nestled on the East Pass, the Choctawhatchee Bay’s main connection to the Gulf of Mexico, it’s an ideal area for boating, fishing, kayaking, and beach combing. A hotspot for both locals and visitors is Crab Island, a shallow sandbar inside the East Pass where people on boats, tubes, kayaks and paddleboards enjoy playing in the clear water and on the white sandy bottom. The coves of Noriega Point are great places for swimmers and snorkelers to explore, with a great view of boats dodging in and out of the harbor from the beach. The harbor in Destin is a bustling hub where charter fishing boats bring in a daily bounty, much of it served at the local restaurants just a few feet from the docks. Click here to view more details. Destin Seafood Festival 2018 poster art by Rebecca Russel.